Choosing the perfect paint color is easier than you think! Interior painting is one of the most low-cost options that you can easily update and refresh your entire home. However, with a myriad of choices, it can be overwhelming deciding on the perfect paint color for different rooms throughout your home. Here, are a few tips that you can use the next time you get stressed over what paint color you want in your bedroom. Whenever you embark on a journey to choose the perfect paint color, it’s critical to think about the mood you want to set in the room. For instance, in an entryway, you may want to create an enticing and enjoyable feeling for your guests. However, in your bedroom, you may want a more moody hue. Every single color on a color wheel has a corresponding mood or tone that it evokes. 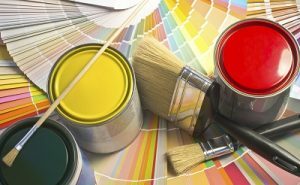 In fact, many homeowners first think about the desired mood of a room before choosing the paint color that they want to use. Therefore, it is always ideal to take some time to think about the energy and mood you want to evoke in your room before you begin painting. A color scheme is just as critical as the mood you want to set in a room. In fact, the problems many homeowners find when it comes to choosing a perfect paint color is thinking about it room by room. Turns out, thinking about the overall color scheme you want to work with is the best way to attack the process of choosing the perfect paint color. Ideally, you want to use a combination of three different colors that are within the same color family. For instance, using colors that complement each other from room to room allows for congruency throughout your entire home.